The "Cs corrector" produces a negative spherical aberration coefficient (Cs) to cancel positive Cs of the objective and condenser lenses, which are axially-symmetric magnetic field lenses. The following Cs correctors are now in practical use. 1) One consists of two hexapoles with opposite polarity and transfer lenses that connect the hexapoles. The first hexapole produces a negative Cs. The unnecessary three-fold distortion produced by the first hexapole is compensated by the second hexapole. The value of negative Cs is doubled by the second hexapole. 2) The other consists of three pairs of elements combining octupoles and quadrupoles. Negative Cs is produced in the X direction by the first element, in the Y direction by the second element and the intermediate direction by the third element, respectively. Cs correction of the objective lens achieves a higher resolution TEM image. Cs correction of the condenser lens leads to a smaller, higher-intensity electron probe, thus, enabling us to obtain a higher-resolution HAADF image and to perform elemental analysis of one atomic column. Figure shows the schematic of a Cs corrector and its basic action. The corrector, which consists of two hexapoles with opposite polarity and transfer lenses connecting the hexapoles, produces a negative Cs and cancels a triangle shape of the beam caused by the first-stage hexapole field using the second-stage hexapole field. In a two-stage hexapole Cs corrector, the thick hexapole field produces a negative Cs, and this action is used to correct the positive Cs of the objective lens. 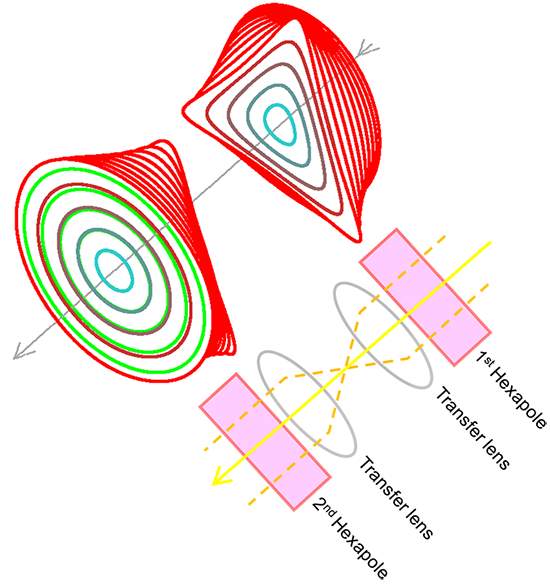 Upper left figure shows the cross section of the electron trajectory in the hexpoles for every 10 mrad angle (from inside blue line to outside red line). The first-stage hexapole field creates a negative Cs but an unwanted triangle shape trajectory. The second-stage hexapole field with the opposite polarity again creates the same amount of negative Cs and the opposite sense of triangle to cancel the triangle shape trajectory caused by the first hexapole, As a result, the amount of negative Cs is doubled and a cylindrical symmetric trajectory is retrieved. Owing to the negative Cs, the cross section of the trajectory expands outwards (shown in red), compared to the trajectory for the case of no hexapole field (in green). With the use of this negative Cs, the positive Cs of the objective lens is canceled. It should be noted that, the transfer lens (lower right figure) is used to transfer an electron beam emerged from the first-stage hexapole into the second-stage hexapole while preserving the beam shape. In the upper left figure, the action of the transfer lens is omitted.